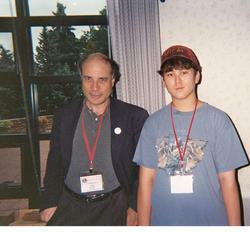 This page is dedicated to my experience at the Mars Society Conference in Boulder Colorado from August 14th-17th, 2008. The gathering was comprised of track talks in varying subjects, which included: propulsion, space suits, and religion in space. There was also evening entertainment, such as the political debate between the two representatives of candidates from the 2008 election. The McCain campaign had an astronaut as his representative. Every track talk and entertainment event had Q&A session, which was convenient. The International Space Station (ISS) continues to do what the vast majority of all U.S., Russian, and Chinese missions have done since Yuri Gagarin’s first flight in 1961 – go in circles around the Earth. Obviously, it would cost a fortune to build a large ship to go to Mars, one that would be comfortable for the bulk of the 2.5 year round trip mission. So I propose that instead of building a new ship, we use what is already in orbit – the ISS itself. Dr. Zubrin thinks that to rapidly accelerate it from its 17,500 MPH orbital velocity to the required escape velocity of 37,000 MPH would be too stressful on the structure. But a small, but steady acceleration could be applied, possibly with an ion propulsion rocket that could be flown into orbit and mated with the ISS. There would also be a need to incorporate a Solar Proton Shield Section to the ISS to protect astronauts from solar flares. My travels around Earth are summarized on the left. The question now is, "How can I earn a ticket to the place in the right?" 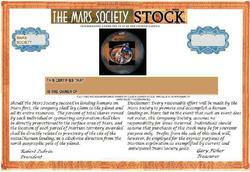 I am a 15-year old member of the Mars Society who attends Satellite High School in Satellite Beach, FL. Currently I am in 11th grade and taking six AP courses. My academic experiences have brought me to believe that a manned mission to Mars is an imperative. Although our economy is in tough times, we need this investment for many reasons. 1. To create jobs (thus boosting the economy), as these would be lost as soon as the Shuttle program shuts down. I do not have anything against the upcoming Orion program, but this country has already been to the moon. In my opinion the goal of NASA needs to be Changed, so as to explore new frontiers, not old ones. 2. To boost morale; when JFK said we were going to the moon, our nation was fired up despite the war in Vietnam and racial turmoil. 3. Finally we must remember that the quest to get the first manned mission to Mars is a race. Either the Chinese or the European Union is going to get there first if you don't give NASA a bigger budget and solid deadlines. If we beat foreign countries to Mars, then we will have pride much like when we beat the Russians to the Moon. I know, President-elect Obama, that you will have much to do in office and many priorities, but we need something new for a new generation of Americans. This is the Change we need. For more about me, please see my web site at http://davidaroffman.com. 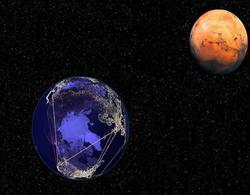 Every science and science fiction fan would love to own a piece of Mars. Why not put all the real estate on the planet up for sale? The size of the lot would be proportional to the amount of stock in the planet bought. If the Government is concerned about potential mineral rights in one area, they can always buy stock for that particular area first – thus taking it off the market. Click on the sample stock below to see what such a ownership certificate would look like.